PMBOK or PRINCE2 … which one is better? I often see debates on project management forums on LinkedIn, blogs and even at the water cooler around the office regarding what project management methodology is best. I have often wondered about the wisdom of such discussions. The two that are always compared are PMBOK (Project Management Body of Knowledge) and PRINCE2 (Projects in Controlled Environments Version 2 – 2009). One such discussion with a fellow professional led me to have a little bit of a think. I will declare my hand at the outset. I have squarely gone for certification route through the Cabinet Office products for project, programme and service management (PRINCE2, MSP and ITIL). This is not necessarily because I was convinced these were the best frameworks, but my assessment of what the market around me considered more valuable. With the Australasian market following that of the United Kingdom and Europe, it made more sense for me to pursue this line, than the PMBOK based certifications from the Project Management Institute (PMI) in PMP and PgMP. Genesis of PMBOK is in the engineering sector in North America. I can see that has led to significant emphasis on the tools and techniques of how to manage projects. I find it has excellent guidance in what it calls the knowledge areas. For example, it provides techniques for monitoring and controlling projects through Earned Value Analysis (EVA), estimation through the Program Evaluation and Review Technique (PERT) analysis. It elaborates on Precedence Diagramming Method (PDM) to identify sequencing and various lag options. It has tools and techniques for scheduling using Schedule Network Analysis, Critical Path and Critical Chain, discusses Resource Levelling and What-if Scenario Analysis. Tools and techniques is where PMBOK has it all over PRINCE2, which goes very little into the skills required to be a project manager. PRINCE2 began with a desire to control capital IT projects in the United Kingdom. Interestingly, a methodology that began in such a technical sphere has very little in the form of guidance through tools and techniques. PRINCE2 is very strong on project governance. Its strength is in the focus on the continued business justification through a living Business Case. In managing by exceptions, it removes the temptation for death by project reports, but at the same time provides a mechanism for escalating when necessary. In managing by stages, it builds in regular reviews of whether the business case the project is trying to deliver to be still valid. The biggest outcome of this is the assertion that a project unlikely to deliver to business case is better cancelled than meandering along. Project structure and principles also ensure projects are delivering to strategic initiatives of the organisation. I have previously posted about the challenge in implementing PRINCE2 as the project framework for supplier organisations. I have used the principles rather than exact implementation as described in the text. It is much easier to take the PMBOK tools and techniques and implement directly into your projects in a supplier context. PRINCE2 however does a better job of risk identification and management techniques with the various response options and planning. There are also pros and cons about the accreditation methods. PRINCE2 is often criticised for allowing potential non-practitioners to get certified because of its examination only method. In order to get a PMP accreditation, you have to go through a significant effort to prove hours under the belt. That is a good idea. But you have to accumulate Professional Development Units (PDU) to stay current. I have seen plenty of mickey mouse outfits dispensing PDUs like confetti to have any meaning to these. When I consider all of this, it appears a futile argument from those in either camp. In my view the best option is to use PRINCE2 to understand “how” to run the project and PMBOK for guidance on “what” to do in the specific scenarios. The question is not one of PMBOK or PRINCE2, but how to use both in your projects. How can suppliers use PRINCE2? I use PRINCE2 as the guiding framework for most of my work. My project management background has been exclusively from a supplier background, delivering services to an organisations implementing projects. One of the strong points of the Cabinet Office products is the importance given to including the suppliers in the project governance at both programme and project level. At the same time, the processes and principles are geared towards achieving the outcome from a customer’s point of view. I have been thinking about how the same principles can be applied from the supplier end. Let us review the reality of the project organisation in PRINCE2. Once an organisation has decided to implement a project, it creates a project team. In many cases, there are gaps in the required skills and suppliers are engaged to fill them. 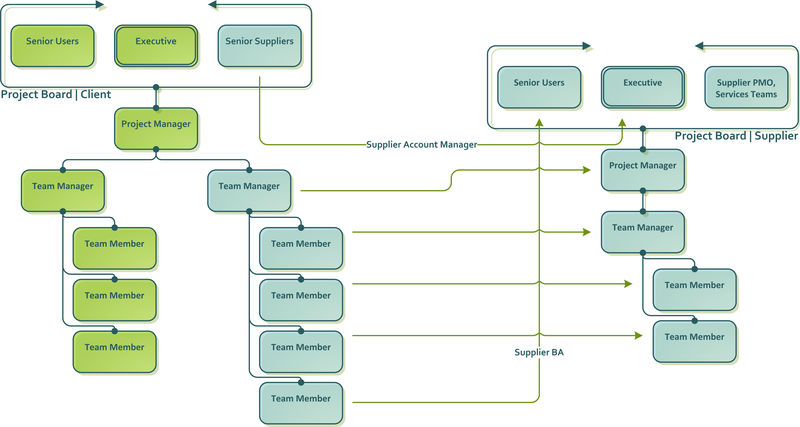 There are two models for engaging the suppliers. One is where the suppliers provide the required skills and it is up to the customer to utilise their skills to deliver the outputs – in effect body shopping. Another model is where the supplier is contracted to deliver a specific set of outputs that the project team will utilise. In most cases it is a hybrid that is used. 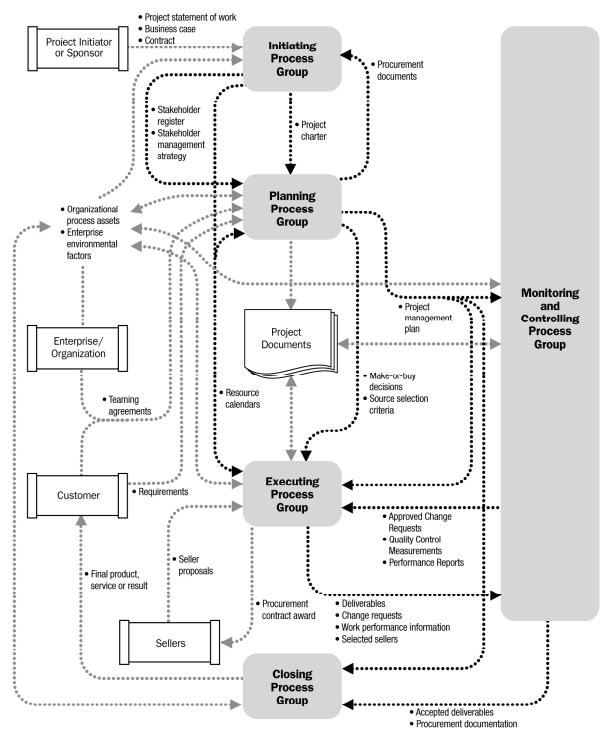 The first scenario is well covered by PRINCE2 organisation and processes. Once the required resources are secured, there is no difference between those and the resources acquired from various in-house teams. The Project Manager can utilise the resources as required. It is the second model where I see applying PRINCE2 sometimes becomes a challenge. In many cases what is considered a project being delivered by the supplier, is only part of a project for the customer. The contracting process is one that places the supplier and the customer is somewhat adversarial roles. In a typical scenario, once a supplier is engaged, someone at an account management role would be expected to sit in the Project Board in a PRINCE2 organisation. The supplier will provide some resources, that will be working under the customer’s Project Manager. The supplier’s Project Manager is really acting as a Team Leader in the larger PRINCE2 organisation. From the customer’s point of view, all the resources provided are really a single team, that is tasked with delivering a set of outputs. However, providing this set of outputs is a project for the Supplier. Can they also run the project as a PRINCE2 project? My view is yes. The Account Manager sitting in the customer’s Project Board can act as the Project Executive internally. They are aware of the strategic direction of the project and are in the best position to judge the tolerance levels. The team delivering services can be augmented with a Business Analyst, who can act as the senior user representative. The teams providing the technical resources can act as senior suppliers. This however, still does not allow for some of the PRINCE2 principles to translate equitably. For example, continuous business justification is totally different for the customer and the supplier. Once a contract is entered into, tolerances are usually set in stone. A fixed deliverable is required, at a fixed price, at a fixed date. If you think from the supplier’s point of view, this does not match PRINCE2 doctrine. There is an element of risk that the suppliers do tack on to the price they charge. However, those are usually set against a series of assumptions. At the time of entering into the contract, the customer may agree to mitigate some of those. In reality it is a challenge to hold the customer to those agreements. This is the adversarial nature I referred to earlier. One particular challenge I have seen is the access to subject matter experts from the customer, which adds risks to the delivery. The internal cost at from a customer’s point of view is simply delayed delivery. From the supplier, it is additional time spent on a project that they could have serviced another customer – lost revenue. Typically the way suppliers have dealt with this scenario is through change control to recover costs. That is still an adversarial approach. It still builds an us and them wall between the customer and the supplier. I would like to see project teams work more in cooperation, where the team working from the supplier too has a stake in the success of the overall project. Procurement methods do not always make it a realistic option. Have you successfully implemented PRINCE2 at a supplier organisation? I would like to hear from you about the challenges and success stories.